Shows to watch for by Robert L. Horton, Drew Merritt, Kathy Liao and Doug Jeck. A portrait can be an opportunity to document people’s lives, explore inner realities or even invent human beings from scratch, as new shows by four artists in Seattle art galleries testify this month. In his bold, stylized acrylic paintings, Seattle artist Robert L. Horton shines a light on key African-American cultural and historical figures. In “Sgt. York,” he creates an iconic portrait of a slave belonging to William Clark who played a vital part in the Lewis and Clark Expedition. In “Her Royal Highness — Queen Nancy Green,” he lends a regal dignity to the woman who became the face of Aunt Jemima pancakes. His two dynamic Revolutionary War battle scenes show black soldiers in the middle of the action — one fighting for the rebels, the other siding with the British. 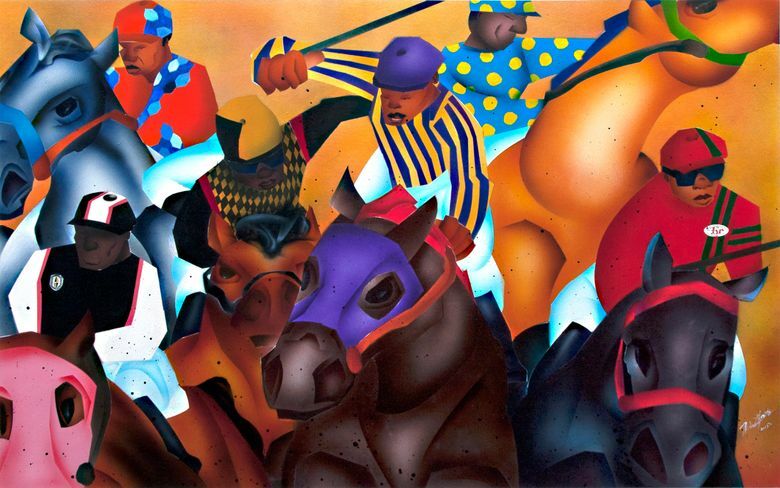 The disciplined verve and compositional complexity of his best pictures is deeply satisfying, especially in “Secretariat,” which shows half a dozen African-American jockeys on their mounts galloping toward the viewer. Accompanying wall text explains that black jockeys had a brief heyday in the post-Civil War South before Jim Crow laws banned them from the track (many wound up working in racetrack stables). Some of Horton’s works — his imaginary album covers, for instance — aren’t so striking. But his more intricate pieces, with their fusion of chaos and control, make a big impression. Noon-5 p.m. Thursdays-Saturdays through July 1, Gallery 110, 110 Third Ave., Seattle (206-624-9336 or gallery110.com). Drew Merritt may be from Los Angeles, but as an artist involved in Seattle’s mural projects, SODO Tracks and The Belltown Corridor, he has a notable local collection. His new show at Treason Gallery features work on a much smaller scale that plays with portrait formats in fascinating ways. Merritt’s oil-on-paper technique can be masterly, and his eye doesn’t just dwell on the surface. Some paintings (“The Bonnet,” “The Happy Couple”) dexterously depict exactly what their titles say, but others (“Mistakes,” “Within Grasp,” “Pour Another Cup of Ambition”) plumb the interior lives and personal histories of their subjects. In several paintings — most strikingly “Priorities,” in which a puzzled figure picks at something the viewer can’t see — the spaces Merritt leaves blank are as crucial as those he fills in. Even the smallest portraits pull you into an intimate world. One large-scale anomaly, “Separation of Body and Soul,” takes up a whole gallery wall with its rendering of a female figure straddling an armchair, facing away from a roiling heap of fabric that seems to be alive. Technique and vision hit rare heights here. Noon-6 p.m. Thursdays-Saturdays through July 1, Treason Gallery, 319 Third Ave. S., Seattle (206-257-5513 or treasongallery.com). 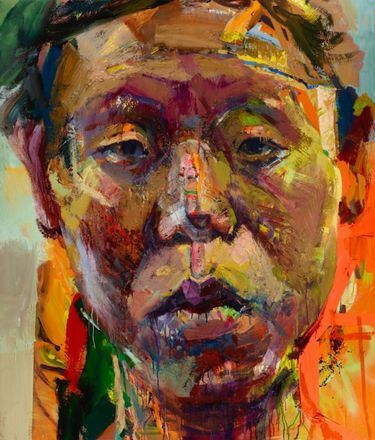 The work of Kathy Liao, who has taught at Seattle’s Gage Academy, has quick-sketch spontaneity and wild color play. You get the sense she’ll use whatever works to make an impact. Slice-and-dice collage with bright-hued Washi tape? Sure — why not. A rainbow of colors on a woman’s nasal bridge? Go for it. “Breathe In,” a self-portrait, takes collage and unlikely pigmentation to extremes, while Liao’s subway scenes (“Scrolling Up and Down,” “Metro Connection Blue”) and atmosphere pieces (“2 a.m. Apparition,” “Float”) seem to view their subjects through candy-colored theatrical gels. In nearly every case, her paintings are visceral, instinctive, expressionist and organic. 10 a.m.-5:30 p.m. Tuesdays-Saturdays through July 1, Prographica/KDR Gallery, 313 Occidental Ave. S., Seattle (206-999-0849 or prographicadrawings.com/). Enter the inner sanctum of Traver Gallery and you may feel you’re in a temple of humming disembodied heads. Twelve untitled terra-cotta busts are arrayed on pedestals around the room, while sound devices hidden inside them produce eerie vocal effects. Taking inspiration from a line in Corinthians (“For in fact the body is not one member but many”), Jeck invents a variety of faces — male, female, young, old — that feel linked by a spirit of inquiry. Some are playful; some are sober. All have their eyes closed as if to concentrate on a barely audible signal. Have a listen, and you may hear it, too. 10 a.m.-6 p.m. Tuesdays-Fridays, 10 a.m.-5 p.m. Saturdays, through July 1. Traver Gallery, 110 Union St., #2, Seattle (206-587-6501 or travergallery.com).